Distaff Lane is to be found on the western edge of the City. Just south of St. Paul’s Cathedral and running down from Cannon Street, past the church of St. Nicholas Cole Abbey to Queen Victoria Street. It sounds like an old street name, which indeed it is, however Distaff Lane is a perfect example of how the City streets have changed over the centuries and what may appear today to be original City streets and lanes are a creation of the last 60 years. I came upon Distaff Lane when I was looking for the location of one of the photos that my father took in the City just after the war. The following photo shows the shell of a church in an area which has suffered considerable bombing damage. 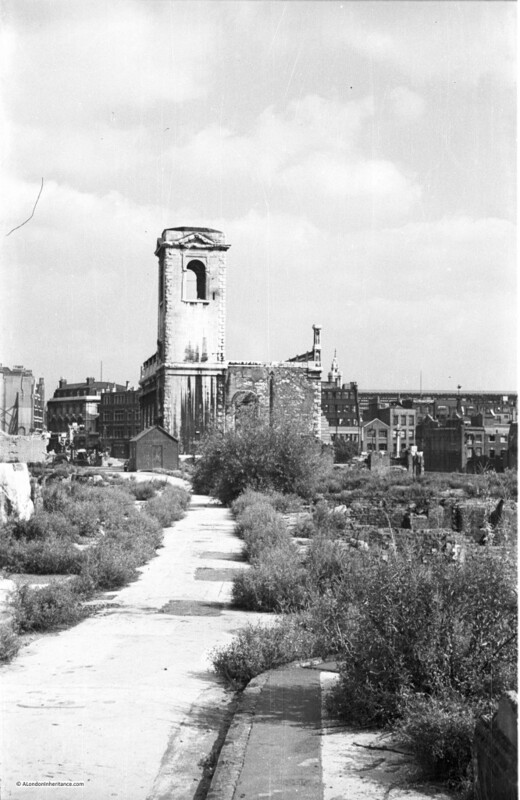 I was able to identify this as St. Nicolas Cole Abbey by the shape and features of the church, along with the position of Cannon Street Station, the original roof of which can be seen on the right of the photo in the distance. The church was fully restored after the war, including the replacement of the spire. The features on the church tower, along with the window to the right of the base of the tower identify this as the same church as the original photo. Note how the orientation of the street has changed slightly and also the width. In the post war photo the kerb of the street can be seen by the plant growth along the edge. The original street was quite narrow compared to the current street. Distaff Lane can be seen curving up from Queen Victoria Street, running past the church then up to the cross roads with Cannon Street, New Change and St. Paul’s Churchyard. The name Distaff Lane is also given to the small pedestrian walkway segment that runs on to join Peter’s Hill and Sermon Lane, and it was from this location just along the pedestrian walkway, looking down Distaff Lane to the church that I took the modern day photo. Distaff Lane is a perfect example of how London’s streets have changed over time. Not just appearance, but also location and name. The church at top left is St Augustine Watling Street. 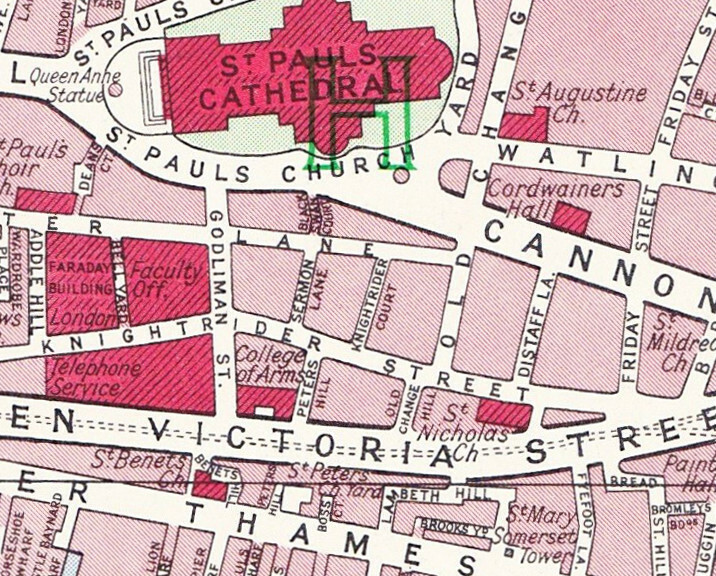 This church is adjacent to St. Paul’s Cathedral which is to the top left of the map extract. 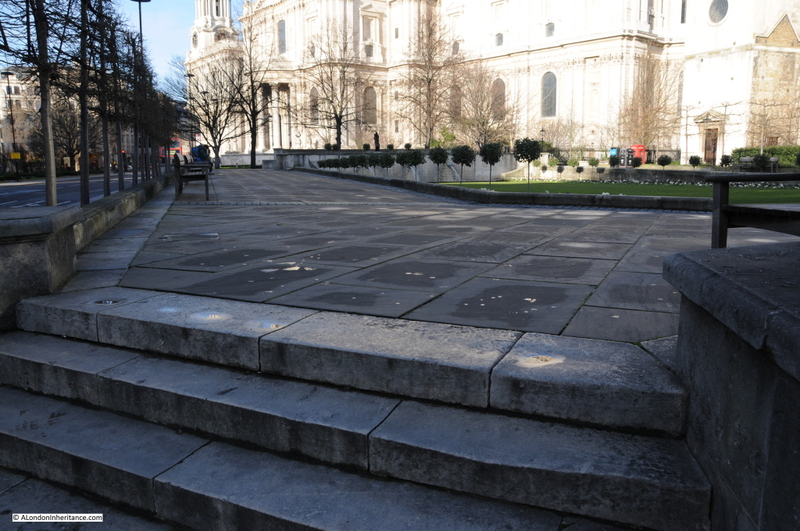 The block of land below Watling Street which includes Cordwainers Hall is now within the pedestrian area around St. Paul’s. 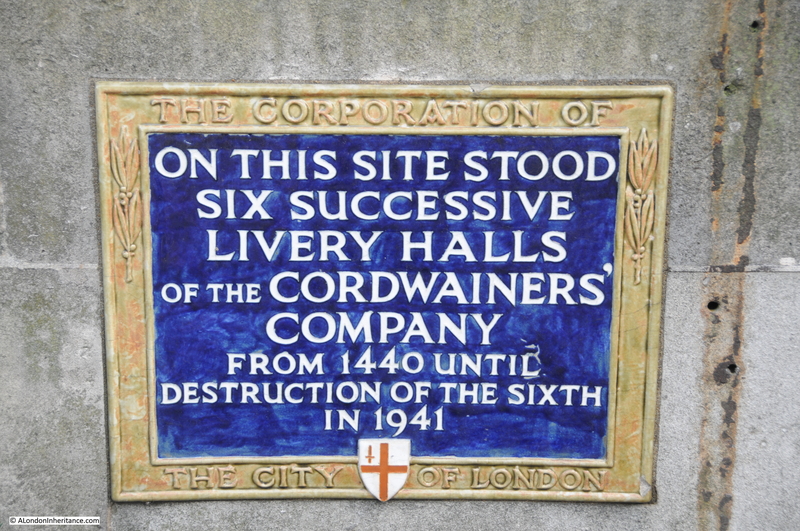 The last Cordwainers Hall on the site was destroyed in the 2nd World War. Below this is the original location of Distaff Lane, running to the right into Baising Lane. This is now Cannon Street. 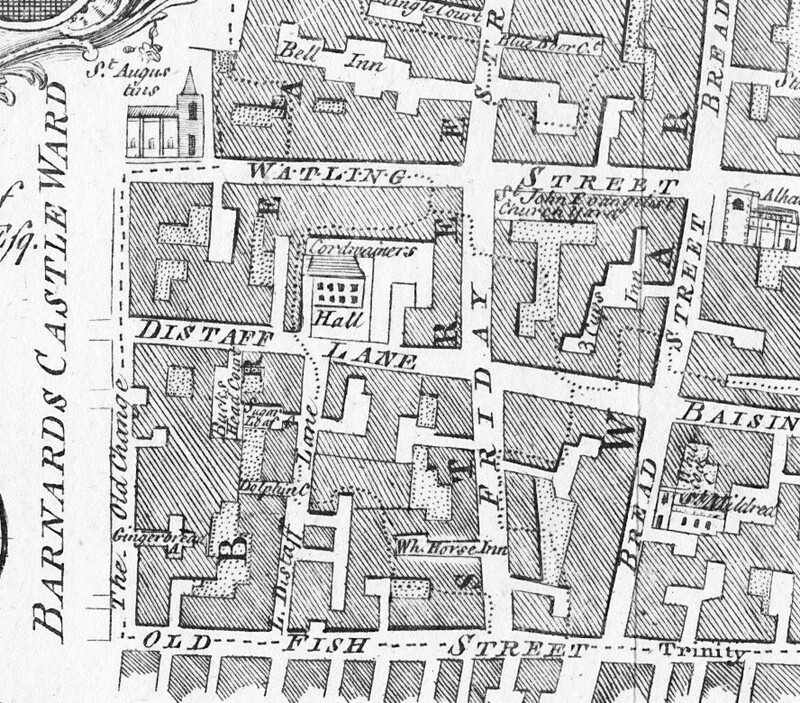 Cannon Street originally ran the length of Baising Lane and was extended across Distaff Lane in 1853-4 when Cannon Street was widened and extended up to St. Paul’s Church Yard. 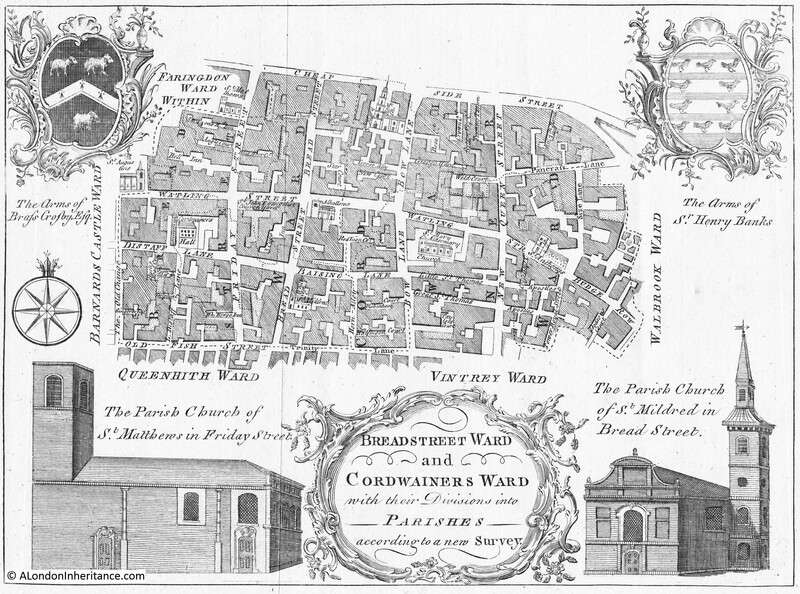 You will see opposite Cordwainers’ Hall another street call Little Distaff Lane. When the original Distaff Lane was replaced by Cannon Street, the “Little” was lost and this street then became Distaff Lane. This was the position up to the point where redevelopment started after the war. A distaff is a stick or spindle used in spinning onto which wool or flax is wound. Some sources also state that this activity was carried out in the lane, which may well be true. “One of these great blocks situated between the Old Change and Distaff Lane was originally occupied by the large German firm of Berens, Bloomberg and Company, dealers in fancy foreign goods of all kinds who came to England shortly after the conclusion of the Napoleonic Wars”. 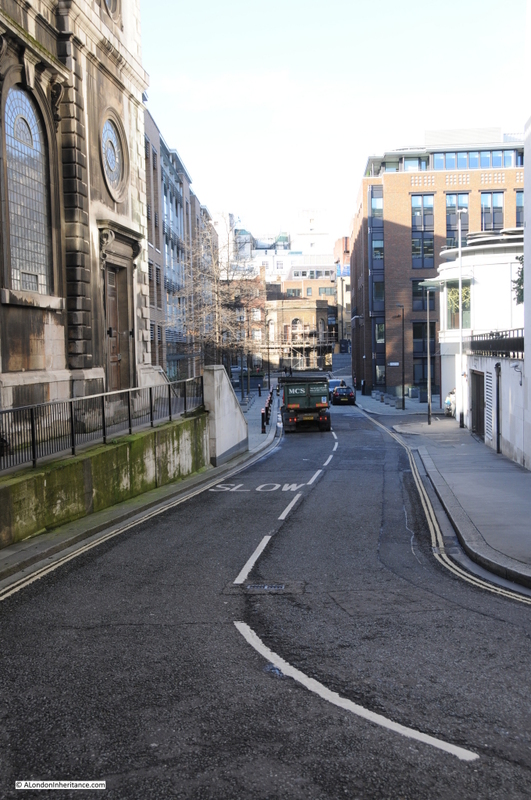 Here we can clearly see Cannon Street running adjacent to Cordwainers Hall over what was the original Distaff Lane. 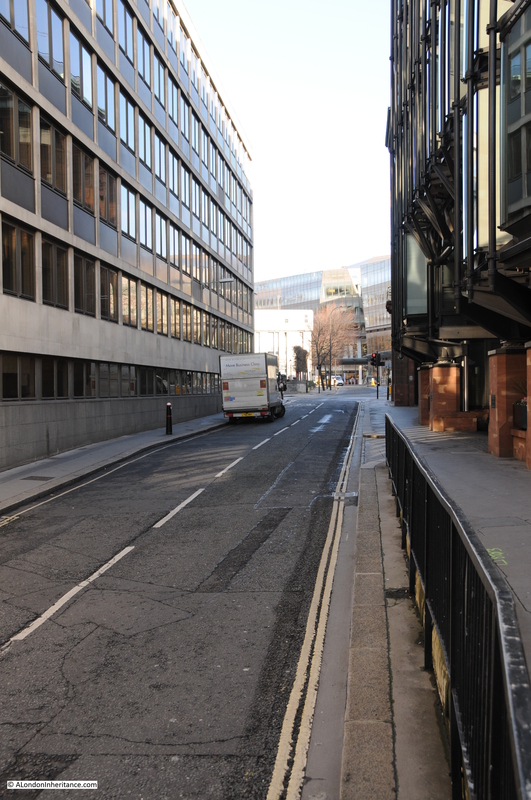 The original Little Distaff Lane is now Distaff Lane and runs from Cannon Street to the junction with Knightrider Street adjacent to St. Nicholas Cole Abbey. Knightrider Street runs over the route of the original Old Fish Street in the Bread Street ward map. We can summarise the changes to the single street which currently bears the name Distaff Lane. Distaff Lane is the short pedestrian stretch and then the whole of the road that routes past St. Nicholas Cole Abbey up to Cannon Street and also the short stretch that routes down to Queen Victoria Street (the street name may not be shown, Google map inserts do not always show the street names along their full length). The short stretch down to Queen Victoria Street (which can be seen on the post war photo and the modern-day photo as a road turning off on the right side) was probably the original Old Change Hill. This length of Knightrider Street (which was Old Fish Street in the original 1766 ward map) is now the enlarged Distaff Lane, which has also included Old Change Hill. 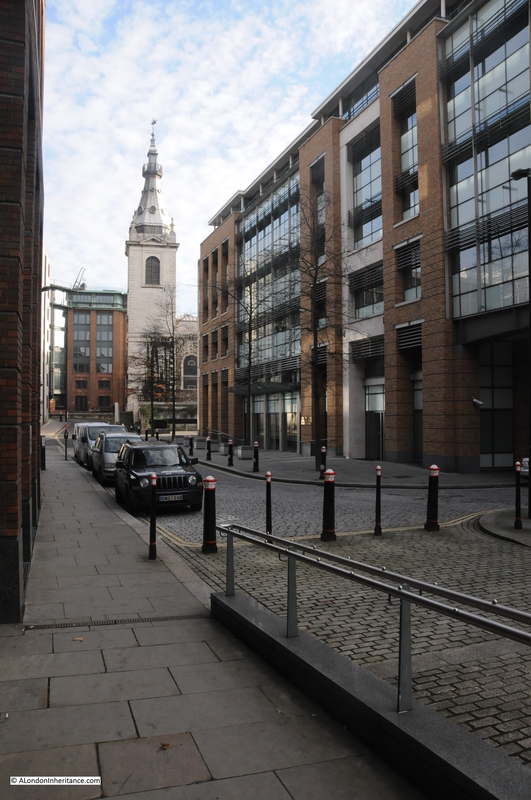 And finally the stretch from the church up to Cannon Street was originally Little Distaff Lane. Distaff Lane is a perfect example of how London has evolved over time. Streets with names that have been in use for many centuries may not always be in their original location, and streets have often changed their names several times. To finish, a quick walk along Distaff Lane. This photo is looking down what was Old Change Hill. Now just a short length of road which stops before it can enter Queen Victoria Street. Walk past this turn off and look left and this is the scene now. This was once the Old Change. It went up from here, crossed Cannon Street and Watling Street. It is now Old Change Court. Walk up to the church of St. Nicholas Cole Abbey and we can look back down Distaff Lane (or what was Knightrider Street). From the same position, turn round and look up Distaff Lane towards Cannon Street. Although very uninspiring, this is the only part of the street that can justify the use of the name Distaff. This is the original Little Distaff Lane. 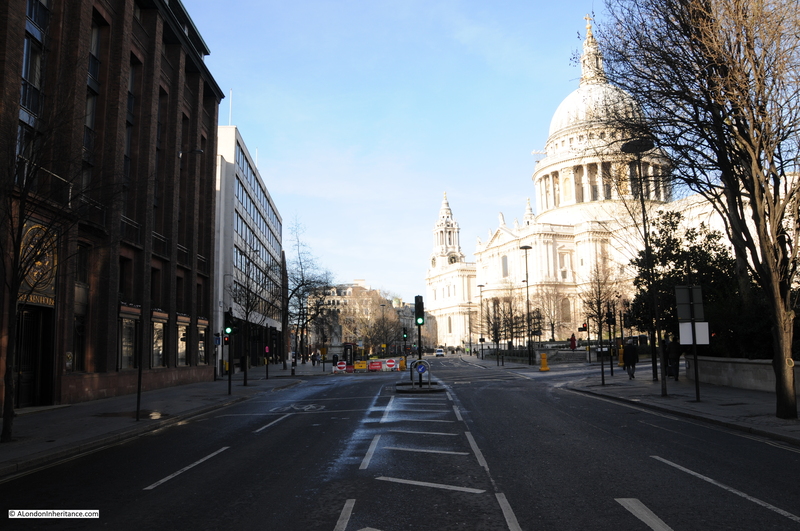 At the top of Distaff Lane, turn right and walk a short distance, then look back to St. Paul’s. This stretch of road is the original Distaff Lane as shown in the Bread Street Ward map (although considerably widened). The original name was lost when Cannon Street was extended to St. Paul’s Churchyard. Walking up to St. Paul’s Churchyard we can see the sign recording the location of the Cordwainers’ Hall as shown in both the original Ward map and the 1940 map. And finally, this is the location of the Cordwainers’ Hall now. 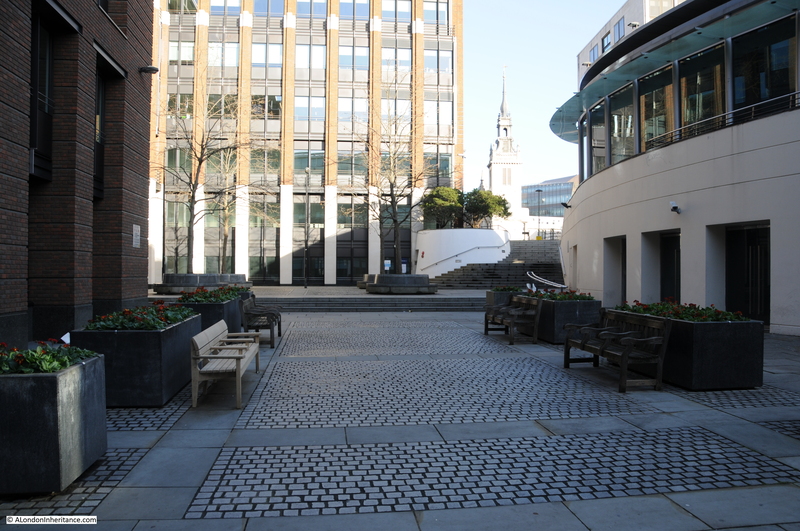 A whole block of buildings were destroyed in the last war and post war redevelopment changed this to a pedestrian / garden area, and opened up the view to St. Paul’s. 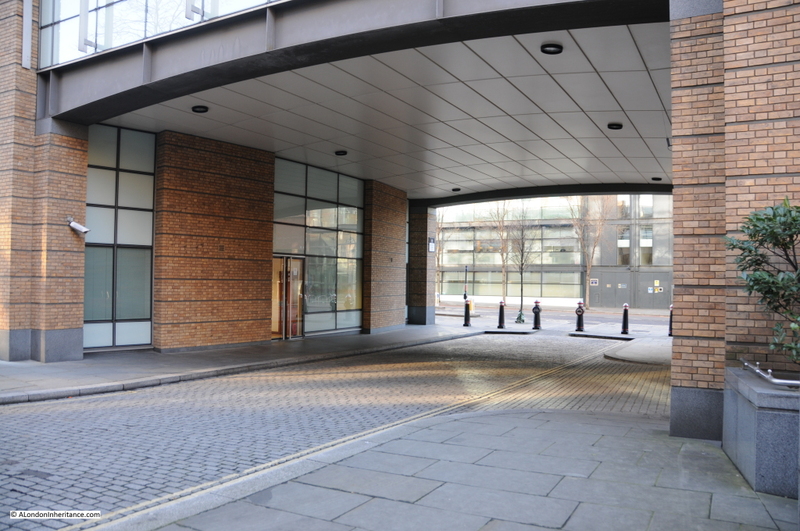 This entry was posted in London Streets and tagged Cannon Street, Distaff Lane on January 25, 2015 by admin. This is fascinating. I’m glad that the old street names do live on even if the original streets don’t. I pity any time traveller trying to find his way around! The film “Pool Of London” 1951 shows the bomb damaged area, untouched since the war. Hi, thanks for the feedback and for letting me know. I do test on I.E. and it seems to be fine. I will investigate further, what version of I.E? Dear Admin – just another not on browser issues – I’m using Chrome on a Chromebook. The map inserts get caught up in page navigation – and a gesture to scroll down the page is often interpreted when the map is visible as a zoom instruction… and I’ve noticed that as the maps are “live”, some of the detail, such as the Wren cafe mentioned, probably change over time and make the notes go out of date. Mike, thanks for pointing out these issues. Not really sure how to fix these as WordPress does not provide (to my basic knowledge) any options, but I will investigate. Well, if no options, I wouldn’t worry – it hardly dents my pleasure in browsing your lovely site. One thing you might be able to do is paste an image of the map at the zoom etc of the time of your post, and maybe with a link to the live map? Best of both worlds?